GuardRFID offers complete solutions for Real-time Location, Safety, and Security in Healthcare, Industrial, and Commercial environments. GuardRFID’s products can accurately track and locate people and assets. The RFID solutions developed by GuardRFID enhance automation, workflow, monitoring, and security – all on one flexible platform. In 2017, Blue Bird Corporation selected GuardRFID’s real-time asset tracking solution to track its in-process buses across its 40-acre facility located at Fort Valley, Georgia. After almost a year of use, the system has exceeded expectations. Previously, it could take hours to find a bus. With this new system in place, locating a bus can now be achieved within seconds by seeing its location on a graphical user interface. A specially-equipped golf cart can also be used to ping the RFID tag as it drives by the bus, which sends a notification to the hand-held device. In addition to significant cost reductions, the system also enhances the quality of on time delivery to customers. GuardRFID’s real-time Asset Tracking solution at the Blue Bird site provides a real-time view of their buses throughout their facility. By integrating both long-range RTLS and close-range portal detection in a single system, it provides precise real-time asset visibility and perimeter security. This powerful combination assists Blue Bird in accurately identifying, locating, tracking, and securing hundreds of buses at any given point in time. Blue Bird uses GuardRFID’s ruggedized Industrial Tag, that has been created to work effectively and efficiently in industrial environments including harsh and hazardous conditions. GuardRFID’s system is proven for high-density tag deployments, with very fast system response times, and offers seamless integration with existing IT policies, standards, and systems, and ready-to-go integration with complementary systems like CCTV & Access control. Blue Bird offers a complete line of Type A, C and D school buses in a variety of options and configurations. Since 1927, Blue Bird Corporation has continued to set industry standards with its innovative design and manufacturing capabilities. Additionally, Blue Bird provides comprehensive financial solutions through Blue Bird Capital Services. Today, Blue Bird has more than 1,500 employees, Georgia-based manufacturing facilities and an extensive network of Dealers and Parts & Service facilities throughout North America. Its global presence can be seen in more than 60 countries through sales into Africa, Asia, the Caribbean, Latin America, Europe and the Middle East. GuardRFID and Linder Industrial Machinery have partnered to provide Linder with real-time inventory visibility, which allows tracking and location of high value assets to enhance productivity and accuracy. AllGuard automatically reports equipment leaving or returning to a yard, and providing continuous monitoring of equipment to prevent loss. Linder provides a wide variety of new, used and rental equipment to fit customer needs across sixteen branch locations. The outdoor and remote locations create challenges for inventory tracking and security measure like fences, lights, and manual management are not the best solutions to prevent theft. These challenges mean that misplaced and stolen inventory is common. This, coupled with time spent by employees having to searching for equipment, resulting in increased costs for industrial operators. This new partnership solves these challenges, as the AllGuard Yard Management monitors all equipment providing Linder with inventory insights and the ability to track their high-value assets in real-time. The AllGuard Yard Management Solution is a robust multi-purpose, real-time location platform designed to augment a business through the use of long-lasting rugged Active RFID tags, and a network of receivers. The tags are placed on equipment and monitored using both long-range, real-time location system (RTLS) and close-range portal detection within a single system. 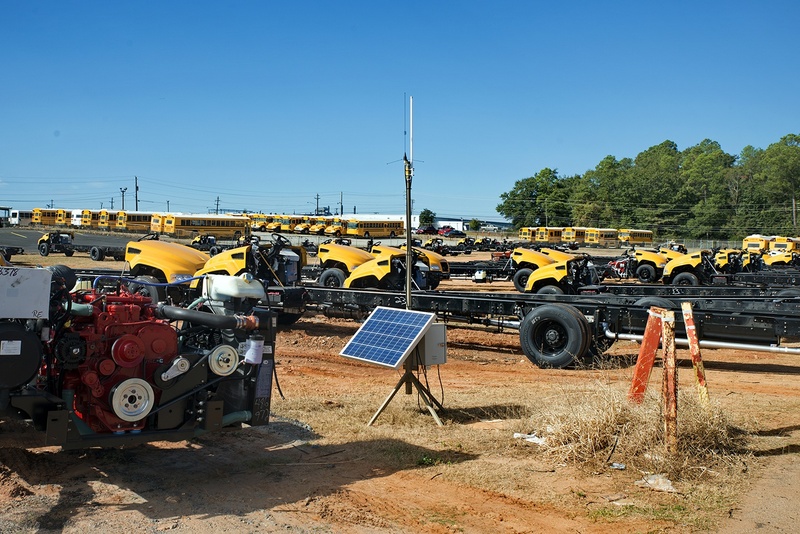 The system can be used to provide a real-time view of inventory across multiple yard sites, and in harsh environments, even those in remote locations without data connectivity or power, as they can be serviced using wide-area wireless networking, and solar power technology. Ultimately, AllGuard provides complete protection for a business against a wide range of operational issues. Linder is committed to seeking solutions that will allow them to continue providing a high standard for delivering quality industrial machinery and through the partnership seeks to streamline current processes and reduce turnaround time. Prior to implementing this solution, the company was writing off $70,000 USD in equipment per year, and then purchasing additional equipment to rent, while the required items were already on site, having been returned unbeknownst to them. Such issues can now be eliminated, as all equipment can be effectively tracked and located using the AllGuard Yard Management system. About Guard RFID Solutions Inc.
About Linder Industrial Machinery Co.
Linder Industrial Machinery Company sells off-road equipment for residential and commercial construction, highway construction, paving, aggregates and mining, landscape construction, forestry, demolition, agriculture, industrial, utility, government, and material handling markets in Florida, North Carolina, South Carolina, and Southeast Georgia. It provides milling machines, pavers, compaction products, crushing products, road wideners, construction products, demolition and scrap attachments, and brooms; parts, used parts, and equipment rental services; and oil and wear analysis program, re-manufacturing and rebuild program, and diagnostics and support program services. Leading RFID solution provider launches industry’s smallest wearable RFID tag with distinct call button feature for protecting patients and staff in real-time. Guard RFID Solutions Inc., a leader in real-time location systems, today announced the launch of its new Personnel Tag (PT-3), a small and lightweight wearable RFID tag with a user-activated push button designed to protect patients and staff at healthcare facilities, and employees working in hazardous industrial environments. With an ageing population and increase in dementia sufferers, studies show that 31 percent of nursing home residents wander from their facility at least once, causing safety concerns for patients and staff alike. In addition, elderly patients at care facilities must currently try to reach a fixed help button or pull cord at their bedside when in need of urgent assistance. Safeguarding patients by preventing the risk of wandering or providing an easier means of calling for help from the bed are key safety goals with few real-time solutions. For staff in healthcare facilities, the threat of violence and injury is pervasive – 76 percent of all nurses experience verbal and/or physical violence, while 75 percent of 25,000 workplace assaults reported annually occur in healthcare settings1. Workplace violence prevention programs are in place, but aren’t always a fast-enough solution against immediate threats. Remote workers in industries like oil and gas exploration or construction can be exposed to perilous conditions. Over a seven-year period, 823 oil and gas extraction workers were killed on the job – a fatality rate seven times greater than for all U.S. industries, with many fatalities due to falls, slips, trips and exposure to harmful substances2. Accounting for where your employees are at all times is vital, particularly when cellphone coverage is poor. GuardRFID’s new PT-3 tag has been designed with these dangerous scenarios in mind and its unique push button can easily be pressed by the holder to call for help in an elopement emergency, workplace accident or Code White situation. The tag is also compatible with GuardRFID’s robust AllGuard platform, which means that warnings and alarms can be generated based on the location of the tag and the activation of the push button on the tag. A focus on design and usability means that the tag can be worn in two ways – either with a pendant or as part of a soft, comfortable wristband. The pendant adapter can be attached to a keychain or lanyard for quick access to the call button. The stylish wristbands are made of an anti-bacterial Thermoplastic Polyurethane (TPU) material designed to withstand repeated exposure to hot water and steam, while making it easy for elderly patients or injured employees to press the push button on their band and call for help. Now available, the PT-3 tag combines its exceptional push button feature with superior real-time situational awareness, comfort, sleekness and ease-of-use to deliver real-time safety to people in hospitals, long-term health care facilities and industrial operations. Plus, it’s backed by the same trusted real-time location identification capabilities as GuardRFID’s family of active tags used to identify, locate and secure people. For more information, please click here. GuardRFID is a proven expert in real-time location systems, driving the next generation of security applications in healthcare, industrial, and commercial environments. With indoor and outdoor installations around the world, GuardRFID delivers a robust multi-purpose real-time location platform with superior flexibility. We help organizations achieve the protection and efficiencies they require when it comes to their people and assets – today and tomorrow. For more information, please visit http://www.guardrfid.com. The infrastructure consists of Tag Readers (TRR, TR2, TRC) and Tag Exciters (TE, PTE) that are deployed in the coverage area based on the location and security needs of the deployment scenario. Guard RFID tags communicate periodically with Tag Readers using 433MHz RFID signaling. The Tag Readers relay this information through Ethernet or WiFi (using a WiFi accessory kit) to the AllGuard Server which calculates the location of the tags and applies any necessary security protocols. Tag Exciters are typically deployed at entrance/exit/choke points of the facility and allow the solution to provide instant location of tags that is used for securing the person or asset of interest. The standard equipment is suitable for indoor deployment. The infrastructure is additionally offered for deployment in outdoor industrial, yard and hazardous (EX-rated) locations. It can be optionally deployed using solar/batteries. A range of tags & attachment options are offered to allow the solution to be utilized in a variety of locations such as hospitals, manufacturing and oil and gas sites. Wearable wrist tags (PT-1 and PT-3) are IP68 rated tags worn using an adjustable wrist band. The PT-3 tag offers a push button that can be configured to alert appropriate personnel when it is pressed by the wearer. The PT-3 tag offers an additional option of attachment using a pendant. They have a 1-year battery life. The ‘ID badge-style’ personal tag (ST-3) is an IP52 and EX rated low-profile tag with two-way communication capability. Two buttons and LEDs and a man down sensor allow alarm generation and confirmation for safety events. Powered using replaceable batteries with a battery life of 1 year. Tag for keychains and hardhats (AT-4) are IP68 and EX rated low profile tags can be attached to an ID badge or a keychain or attached to a hard-hat. They have a battery life of 2 years with typical use. The GuardRFID Asset Tracking solution uses Ultra-High Frequency (UHF) Beaconing alongside Low Frequency (LF) proximity detection to provide RTLS and room level location of assets. Low Profile Asset Tags (AT-4 and AT-5) These IP68 rated tags have an industry leading low profile (6mm) and small footprint. They can be discretely placed on almost any surface, including metal, without significant degradation in performance. The AT-4 tag is rated for use in hazardous (EX Class 1 Division 1) environments. The AT-5 tag offers a tamper detection capability. Industrial Tags (IT-2): This is a highly ruggedized tag that is waterproof and can withstand significant shock and vibration. It has been specifically developed for use in indoor and outdoor industrial and commercial applications. The tag can be easily mounted on metal surfaces with minimal degradation of its RF performance. The IT-2 is rated for use in potentially explosive environments (EX Class 1 Division 1).